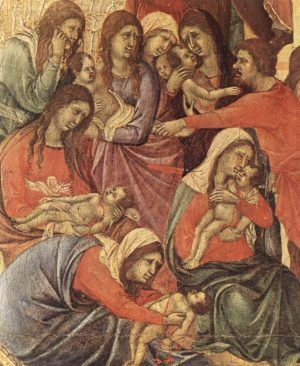 This octave of Christmas the Church celebrates the memory of the small children of the neighborhood of Bethlehem put to death by Herod. Sacrificed by a wicked monarch, these innocent lives bear witness to Christ who was persecuted from the time of his birth by a world which would not receive him. It is Christ himself who is at stake in this mass-murder of the children; already the choice, for or against him, is put clearly before men. But the persecutors are powerless, for Christ came to perform a work of salvation that nothing can prevent; when he fell into the hands of his enemies at the time chosen by God it was to redeem the world by his own Blood.